The House on Wednesday passed a bill that would make it easier to fire employees at the Veterans Affairs Department. Despite a veto threat from the White House and widespread opposition from federal employee advocates, lawmakers approved in a 256-170 vote the 2015 VA Accountability Act, which would give the VA secretary much more flexibility to demote and fire corrupt or poor-performing employees, not just top officials. The bill essentially would expand to the entire VA workforce the authority of the 2014 Veterans Access, Choice and Accountability Act, which made it easier to get rid of senior executives engaged in wrongdoing at the department. Under H.R. 1994, the employee could file an appeal to the Merit Systems Protection Board within seven days of his or her removal. MSPB would have to rule within 45 days of the appeal filing. The legislation also would limit the amount of time an employee can be on paid administrative leave to 14 days in a one-year period. Due process for most of the federal workforce now requires that agencies notify employees within 30 days of an adverse action (including removal), and provide them with seven days to respond and an opportunity to defend themselves. The bill also would extend the probationary period for new VA employees from one year to 18 months, and allow the secretary to extend that even further. An amendment included in the bill offered by Rep. Dan Benishek, R-Mich., would hold VA managers individually responsible for implementing recommendations from the inspector general on improving department operations, and would withhold performance awards from those who fail to do so. “Poor performances and bad actors still continue to undermine the VA,” said Rep. Pete Sessions, R-Texas, who is chairman of the House Rules Committee, during floor debate on Wednesday. 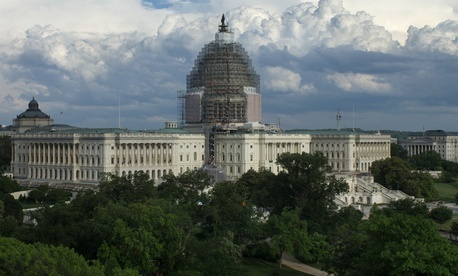 Wednesday was the House’s last day before it leaves for August recess. Sessions said H.R. 1994 was necessary because VA was not sufficiently using the flexibility in the 2014 law to fire bad apples. “Because the VA has a long and documented history of failing to hold employees accountable, we are back here today with another bill,” he said, arguing that by changing the law Congress was giving the VA the tools it needs to hold poor performers accountable. VA officials, while they have not said they support H.R. 1994, have told lawmakers that the current personnel system makes it too difficult for them to fire poor employees expeditiously. H.R. 1994 includes provisions aimed at protecting VA whistleblowers including limiting the secretary’s authority to fire or demote an employee who is a whistleblower and punishing supervisors who retaliate against employees who speak up about wrongdoing. But several House Democrats who spoke on the floor Wednesday said H.R. 1994 would have a chilling effect on whistleblowers, undermine due process in the government’s civil service system, and hurt efforts to recruit and retain talented employees. “H.R. 1994 would make VA the only at-will workplace in the federal government,” said Rep. Mark Takano, D-Calif., adding that more than 30 percent of VA’s 300,000-plus workers are veterans. “It’s wrong to assume VA employees are guilty until proven innocent,” he said. Takano unsuccessfully offered an alternative to H.R. 1994 during debate. That measure would have limited the firing flexibilities sought in H.R. 1994, instead allowing the secretary to immediately remove or suspend without pay employees engaged in activity that poses a direct threat to public health and safety, providing them with due process on the back end. The legislation “would remove important rights, protections, and incentives which are available to the vast majority of federal employees in other agencies across the government and are essential to ensure that federal employees are afforded due process,” the White House statement said. House Veterans’ Affairs Committee Chairman Jeff Miller, R-Fla., who introduced the bill, pointed out on Wednesday that the authority and flexibility to discipline all employees in H.R. 1994 is the same as the authority mandated in the 2014 law to make it easier to fire senior executives, which President Obama signed and many Democrats supported. “I’m not sure why the president has changed his opinion almost exactly a year later,” Miller said during debate. While the Senior Executives Association opposes H.R. 1994, the group had a similar reaction as Miller to the White House’s veto threat. “We are amazed that this bill, which mirrors last year’s Veterans Access, Choice and Accountability Act, is now only causing alarm within the administration,” said SEA President Carol Bonosaro in a statement. “In fact, the 2014 Act is a more draconian version of H.R. 1994, yet the administration had no issue then with whether the new legal removal authority and process affected the due process rights of career senior executives, who are not in any bargaining unit and therefore are not represented by unions,” Bonosaro said. Miller on Wednesday also took to task Democrats who opposed H.R. 1994, most of whom supported the 2014 law. Democrats offered a tepid defense. H.R. 1994 also includes several provisions specifically affecting senior executives. One would allow the VA secretary to strip pension benefits from VA senior executives who are convicted of a crime that influenced their job performance, and then fired. It would prevent senior executives about to be fired because they were convicted of such a felony, but who instead retire, from receiving their full retirement benefits. The secretary would be allowed to take away the government contribution portion of the pension for the time period in which the employee was engaged in behavior warranting removal. The rest would be returned to the employee in a lump sum. A third party entity would review the secretary's decision. Another measure in the bill would require the reassignment of VA senior executives to new posts every five years. The legislation also would limit the number of bonuses the department gives out annually to senior executives. Several groups have expressed support for the 2015 VA Accountability Act, including Veterans of Foreign Wars, Iraq and Afghanistan Veterans of America, and Concerned Veterans for America. Others strongly oppose it, including the American Federation of Government Employees, which represents more than 220,000 non-management VA employees, in addition to the Senior Executives Association. The Senate Veterans’ Affairs Committee approved companion legislation in the upper chamber last week.